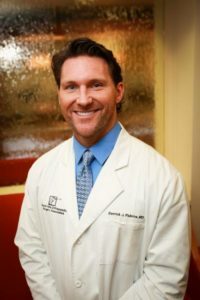 Dr. Derrick Fluhme has been with South Hills Orthopaedic Surgery Associates since 2005, specializing in arthroscopic surgery of the shoulder and knee, as well as total joint replacements of the knee and hip. Growing up in the South Hills of Pittsburgh, Dr. Fluhme developed an early interest in Orthopaedics. The Thomas Jefferson graduate had several sports related injuries requiring Orthopaedic care, and thus decided this field was his calling. Dr. Fluhme attended the University of Notre Dame, where he received his Bachelor’s Degree in Pre-Professional studies. Following his undergraduate career, he received his Medical Doctorate and Master’s in Physiology from Georgetown University before coming to Pittsburgh to complete his residency at The University of Pittsburgh School of Medicine within the Orthopaedic Surgery Department. He was then accepted into the prestigious Kerlan-Jobe Orthopaedic Clinic in Los Angeles, California for a fellowship in sports medicine. While there, he served as a team physician for the Los Angeles Dodgers and Lakers. Upon his fellowship completion, he returned home to Pittsburgh. He joined The South Hills Orthopaedic Surgery Associates, where he has been in practice since 2005. He specializes in sports medicine and total joint replacement. Dr. Fluhme is a member of the American Society of Orthopaedic Surgeons, the Pennsylvania Medical Society, the Allegheny County Medical Society, and the Arthroscopy Association of North America. He is affiliated with Advanced Surgical Hospital, St. Clair Memorial Hospital, and Radiance Surgery Center. He is the team physician at Washington & Jefferson College Athletics, as well as the team physician for the California University of Pennsylvania hockey team, while also keeping close ties with several local high school athletic programs. Dr. Fluhme is married with two children. He is very active in youth sports, as he coaches several local and travel baseball and hockey teams.